The aim of this study is to examine the psychometric qualities of the Turkish version of Sport Consumption Behavior Intention Scale (SCB). The data for the study were obtained from 694 spectators of three different professional football teams. The results of confirmatory factor analysis applied to the data have revealed that the data set was in good fit with the three factor structure formed. Moreover, internal consistency coefficients calculated have shown that the sub-dimensions of attendance intention, media consumption intention and licensed merchandise consumption intention included in the scale are highly reliable. Statistical results obtained from the study show that the adapted Turkish version of the scale was a valid and reliable measurement instrument. Bollen, K.A. (1989). Structural equations with latent variables, New York: John Wiley and Sons. Byrne, B.M. (1998). Structural equation modeling with LISREL, PRELIS and SIMPLIS: Basic concepts, applications and programming, New Jersey: Lawrence Erlbaum Associates. Carenys, J. and Sales, X. (2012). Tailoring performance management systems: A sports merchandiser's case, Sport, Business and Management: An International Journal, 2 (2): 115- 126. Chau, P.Y.K. (1997). Reexamining a model for evaluating information center success using a structural equation modeling approach, Decision Sciences, 28 (2): 309–334. De Schriver, T.D. and Jensen, P.E. (2002). Determinants of spectator attendance at NCAA Division II football contests, Journal of Sport Management, 16 (4): 311-330. Dobie, K., Grand, J. and Zarick, J. (2005). Sports Fan Involvement in New Zeland: The case of criket, football (soccer) and rugby. In: Where sport marketing theory meets practice: Selected papers from second annual congress of the sport marketing association, Sport Marketing Association, 19-25. Fink, J.S., Trail, G.T. and Anderson, D.F. (2002). An examination of team identification: Which motives are most salient to its existence? International Sports Journal, 6 (2): 195-207. Hair, J.F., Black, W.C., Babin, B.J., Anderson, R.E. and Tatham, R.L. (2006). Multivariate data analysis (6th ed. ), New Jersey: Pearson. Hooper, D., Coughlan, J. and Mullen, M. R. (2008). Structural Equation Modelling: Guidelines for Determining Model Fit, The Electronic Journal of Business Research Methods, 6 (1): 53-60. Hu, L.T. and Bentler, P.M. (1999). Cutoff criteria for fit indexes in covariance structure analysis: conventional criteria versus new alternatives, Structural Equation Modeling: A Multidisciplinary Journal, 6 (1): 1-55. Kelloway, E.K. (1998). Using LlSREL for structural equation modeling: A researcher’s guide, Thousand Oaks, CA: Sage. Kesenne, S. (2007). The economic theory of professional team sports: An analytical treatment, Cheltenham: Edward Elgar Pub. Kim, Y.K. and Trail G.T. (2011). A conceptual framework for understanding relationships between sport consumers and sport organizations: A relationship quality approach, Journal of Sport Management, 25 (1): 57-69. Kim, Y.K., Trail, G.T. and Ko, Y.J. (2011). The influence of relationship quality on sport consumption behaviors: An empirical examination of the relationship quality framework, Journal of Sport Management, 25 (6): 576-592. Kline, R.B. (2011). Principles and practice of structural equation modeling (3rd ed. ), NY: Guilford Press. Kwon, H.H., Trail, G.T. and James, J.D. (2007). The mediating role of perceived value: Team identification and purchase intention of team-licensed apparel, Journal of Sport Management, 21 (4): 540-554. Levin, M.A. and Mc Donald, R.E. (2009). The Value of Competition: Competitive Balance as a Predictor of Attendance in Spectator Sports, International Journal of Sports Marketing and Sponsorship, 11 (1): 7-24. Marsh, H.W., Balla, J.R. and Mc Donald, R.P. (1988). Goodness-of-fit indexes in confirmatory factor analysis: The effect of sample size, Psychological Bulletin, 103 (3): 391-410. Mc Donald, R.P. and Moon-Ho, H.R. (2002). Principles and practice in reporting statistical equation analyses, Psychological Methods, 7 (1): 64-82. Mullin, B.J., Hardy, S. and Sutton, W.A. (2000). Sport Marketing (2nd ed. ), Champaign: Human Kinetics. Nunnally, J.C. (1978). Psychometric theory, New York: Mc Graw Hill. Nunnally, J.C. and Bernstein, I.H. (1994). Psychometric theory (3rd ed. ), New York: Mc Graw Hill. Schmelleh-Engel, K., Moosbrugger, H. and Müller, H. (2003). Evaluating the fit of structural equation models: Tests of significance and descriptive goodness-of-fit measures, Methods of Psychological Research Online, 8 (2): 23-74. Shank, M.D. (2005). Sports marketing: A strategic perspective (3rd ed. ), New Jersey: Pearson Education Inc.
Şimşek, Ö.F. (2007). Introduction to structural equation modeling; basic principles and LISREL applications, Ankara: Ekinox. Trail, C.T., Anderson, D.F. and Fink, J.S.(2005). Consumer satisfaction and identity theory: A model of sport spectator co-native loyalty, Sport Marketing Quarterly, 14 (2): 98-112. ISNAD Kiremitci, Olcay , Demiray, Erdinç , Aycan, Ali , Gençer, Ramazan . "ASSESSING THE VALIDITY AND RELIABILITY OF THE SPORT CONSUMPTION BEHAVIOR SCALE ON TURKISH FOOTBALL SPECTATORS". 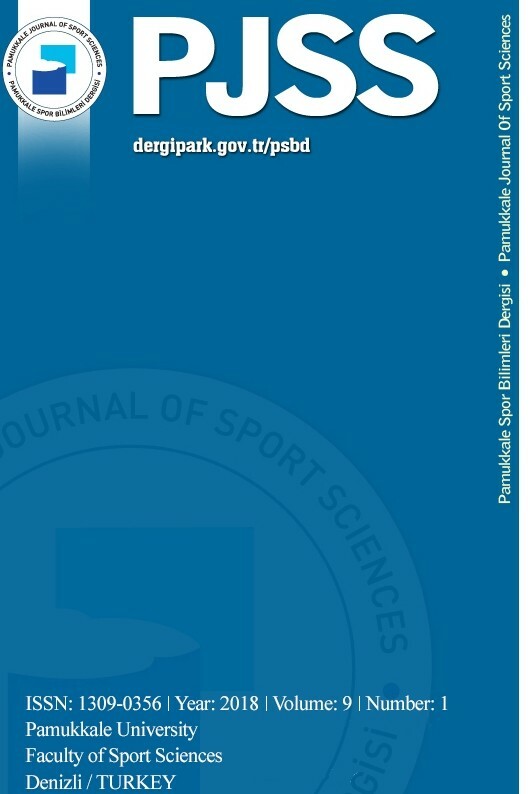 Pamukkale Journal of Sport Sciences 5 / 2 (May 2014): 11-20.